↑ Hunt, Ken. "Ravi Shankar – Biography". Allmusic. 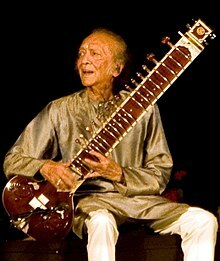 http://www.allmusic.com/artist/ravi-shankar-p3434/biography। আহৰণ কৰা হৈছে: 15 July 2009. ↑ "Hard to say no to free love: Ravi Shankar". Press Trust of India. Rediff.com. 13 May 2003. http://www.rediff.com/news/2003/may/13ravi.htm। আহৰণ কৰা হৈছে: 18 July 2009. ↑ Lindgren, Kristina (21 September 1992). "Shubho Shankar Dies After Long Illness at 50". Los Angeles Times. http://pqasb.pqarchiver.com/latimes/access/61210384.html?FMT=ABS। আহৰণ কৰা হৈছে: 31 August 2009.